1) What books should young boys read? 2) And young girls? … 3) [and both/either] What should grown-ups read? [and/or] What are Mr. Samuel Clemens’ favorite books? 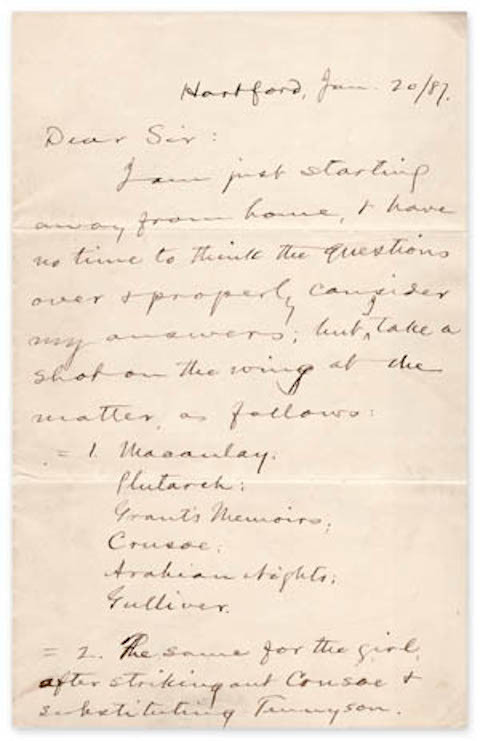 Twain, in a hurry, “took a shot on the wing” and replied with the letter below, which, despite his protestations of haste, seems fairly well-considered. I’ll admit that the ambiguity of the last sentence, however, gives me the researcher’s buzz to go back and dig through more archives for Crane’s original letter. = 2. The same for the girl, after striking out out Crusoe & substituting Tennyson. I can't answer No. 3 in this sudden way. When one is going to choose twelve authors, for better for worse, forsaking fathers & mothers to cling unto them & unto them alone, until death shall them part, there is an awfulness about the responsibility that makes marriage with one mere individual & divorcible woman a sacrament sodden with levity by comparison. I should be sure of these; & I could add the other three - but I should want to hold the opportunity open a few years, so as to make no mistake. See all six manuscript pages of Twain’s letter (and zoom in to examine them closely) at the Shapell Manuscript Foundation. We've added links to Twain's recommended texts above. You can find many in our Free eBooks and Free Audio Books collections. Neil deGrasse Tyson Lists 8 (Free) Books Every Intelligent Person Should Read. I wonder if “the other three” were Twain’s own works, and he was showing (possibly tongue-in-cheek) humility by suggesting he’d wait a few years to see if they’re worthy. Marvelous contribution about Samuel Clemens. Could you please advise the author of the recent discovery of a double ambrotype of Samuel Clemens, likely made in Nevada in 1861? To see it, proceed to http://www.kaplancollection.com.